In all the hubbub in the world of leg exercises surrounding the quads, hamstrings, and calves, you may have never heard of the peroneals! These three little guys are often overlooked in favor of the more glamorous, showy leg muscles, but if you’re serious about health and fitness, you should get to know the peroneals so you can stretch, stabilize, and strengthen these key ankle stabilizers as needed. Overactive, tight peroneals are associated with some problems commonly plaguing exercisers. Underactive, weak peroneals contribute to their own set of issues. If you understand the interesting structure and function of the peroneal muscles, you will see why they are important. Keep reading to learn more so you can give these supporting players their due! What are the Peroneals and Where are they Located? The peroneals are three different muscles on the outside of the lower leg: peroneus longus, peroneus brevis, and peroneus tertius. The peroneals may also be referred to as the fibularis muscles. The peroneals are named for their lengths. P. longus is the outermost and longest peroneal, originating on the upper lateral fibula. The p. longus tendon travels behind the outside prominence of the ankle, crossing the bottom of the foot to insert into the first metatarsal, which is the long bone leading up to the big toe. 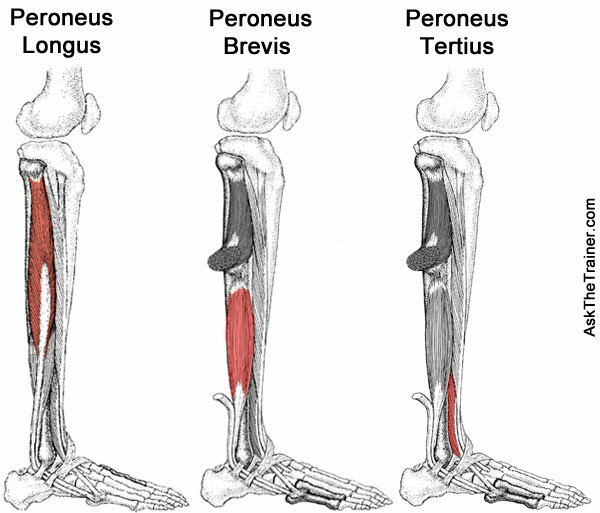 Peroneus brevis is shorter (brevis meaning brief) and located underneath p. longus. P. brevis originates on the lower lateral fibula. Its tendon travels alongside the p. longus tendon, but stops short to insert into the fifth metatarsal, which is the long bone leading to the smallest toe. Peroneus tertius is a little different than the others, being quite small, and originating on the lower part of the front of the fibula instead of the side. Also, the p. tertius tendon passes in front of the outer ankle and inserts on top of the fifth metatarsal. What are the Functions of the Peroneal Muscles? Peroneus longus and peroneus brevis work together to plantarflex and evert the foot. Plantarflexion is the act of pointing the toe downward, or flexing the plantar surface (sole) of the foot. Eversion is the act of pronating the foot, or turning the soles away from each other. P. longus and p. brevis also work to slow down the opposite actions of dorsiflexion and inversion performed by other lower leg muscles. P. tertius works with the other peroneals to evert/pronate the foot, but interestingly, opposes the other peroneals in that it dorsiflexes rather than plantarflexes the foot. This makes sense when considering its insertion point: remember that the tendon of p. tertius inserts into the top of the foot in contrast to p. longus and p. brevis, whose tendons insert into the bottom of the foot. What Role do the Peroneal Muscles play in Posture and Stability? All three peroneal muscles are important in dynamic stabilization of the foot and ankle complex. They help bring the foot to a plantarflexed and everted position while they balance out other muscles attempting to do the opposite actions. The peroneals are especially important when walking on uneven terrain, such as when you’re out in nature on trails, rocky surfaces, etc. When functioning properly, the peroneals stabilize the foot and ankle complex, protecting you from injuries such as ankle strains and sprains. Remember that everything in the human movement system is connected, and each area must be stable, not too tight or too loose, for the whole system to function properly. Problems with the feet and ankles are very common among athletes and non-athletes alike, and may become more serious with time as well as contribute to problems in the knees, hips, and elsewhere. Below, I’ll go over a few physiological issues which may be caused by or contributed to by improperly functioning peroneals. What Problems are Associated with Tight, Overactive Peroneals? Overpronation of the foot may be caused by or contributed to by tight, tense peroneal muscles. Overpronation is when the inner surface of the foot rolls too much toward the midline of the body. To determine whether or not you overpronate, look at the soles of your shoes, and if they are more worn on the inner surface, you are overpronating. Overactive peroneals contribute to a higher incidence of ankle injuries such as sprains and sprains, and the development of painful chronic conditions such as tendonitis due to the cumulative injury cycle. Tight peroneals may misalign the head of the fibula, throwing off the leg’s movement system, and possibly causing issues from the ankle to the knee to the hips and lower back. Tight, tense peroneals are common in high heel wearers. Read our article on posture problems caused by high heels to learn why it’s actually best to ditch high heels altogether! What Problems are Associated with Weak, Underactive Peroneals? Peroneus longus helps stabilize the midfoot. If it is weak, you may develop a painful bunion on the bottom of the foot. The peroneals are the only muscles that can prevent your foot from rolling in during a fall. If they are weak, you are at risk for rolling your ankles, resulting in sprains, strains, and even breaks. What are the Best Stretching Exercises for the Peroneal Muscles? If you have tight peroneals, it’s best to focus on flexibility exercises rather than strengthening exercises for the peroneal muscles. Corrective flexibility is best achieved through a combination of self-myofascial release and static stretching. Check out our video on self-myofascial release for the calf muscles to learn how to target tight lower legs. Turn the focus away from the calf muscles and toward the peroneals by turning slightly to the side, rolling the outside of the lower leg rather than the back of the lower leg. Roll the tender area of the peroneals for at least 30 seconds. Immediately follow the foam rolling with a static stretch for the peroneals as shown in this video from Sportsinjuryclinic.com. Hold the stretch for at least 30 seconds. Do these peroneal stretches every day and before and after each workout session if you have tight, tense peroneal muscles. What are the Best Strengthening Exercises for the Peroneal Muscles? If you have weak peroneals, you should work to strengthen them. You may also be prescribed peroneal strengthening exercises by a physician or physical therapist as part of your recovery program from ankle injuries. Stretching weak peroneals won’t help the situation, only serving to stretch them out even more than they already are. Warming them up with several gentle circles in each direction before your strengthening exercises is always a good idea, though. Tie your resistance band to a sturdy object such as a sofa leg. Place your foot in the loop and evert it against the resistance while keeping the rest of the leg as still as possible. Perform 10-20 repetitions before switching sides. Calf raises, either with both legs or on a single leg, can help strengthen the peroneals. This exercise requires only your body weight. If you are in doubt about the stability of your ankles, start slow with both feet before progressing to one leg. Simply rise up onto your toes from a position of standing flat on the ground, focusing on optimal posture. Alternatively, if you want more of a challenge, perform a negative calf raise by standing on a raised object such as a stair with your heel hanging off the edge. Allow the heel to slowly dip down below the level of the step before rising back up onto your toes. In this video, both methods are nicely demonstrated. For an even greater challenge, you can add some resistance by holding a weight plate or dumbbell during the exercise. Our article on Stabilization Exercises for Feet and Ankles also goes over several great exercises that serve to build stability in the peroneals as well as other key foot and ankle muscles. Since the peroneals are fairly “humble”, non-showy muscles, they may be overlooked in both strengthening and stretching routines. However, as you learned in the paragraphs above, the peroneals play a key role in stability of the foot and ankle complex, so it’s a mistake to ignore these little guys! Doing so over time may put you at increased risk for injuries and interfere with optimal movement during functional activities. The tips in this article are meant as a starting point, and like any other articles you read online, are not intended to replace a doctor’s advice. If you have a foot, ankle, or knee issue, stop your exercise routine and make a visit to your doctor to determine the cause of the problem. Your doctor will be able to tell you whether and when it’s safe to continue exercising.